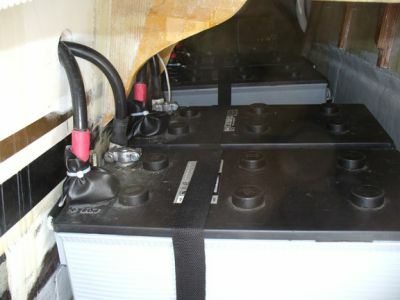 The approximate 600lbs of batteries will be moved to the lazarette to help offset the added flotation of the extension. Two of these treated 3x10s will be used to hold the four 8D batteries. This board is marked so it can be cut to the contour of the transom. 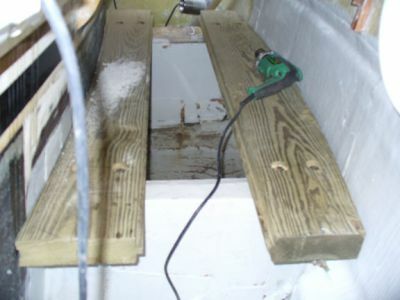 The two boards are bolted in place. The batteries will span the boards, running fore and aft. This will add approximately 600lbs and should bring the waterline closer to where we want it. We are trying to determine the amount of wire we will need in order to move the batteries. For safety, this needs to be done right and also because of the cable cost - approximately $18.00 per foot. 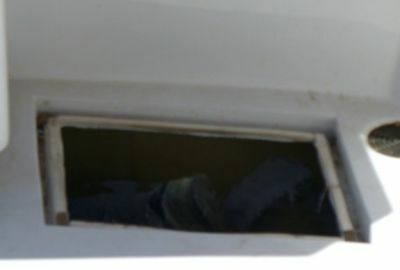 For some reason, these cabinets did not have covers and were exposed when we bought the boat. We have made covers and will install them when the battery relocation has been completed. These boards were cut and painted to cover the battery junction. In addition, the Imtra underwater light control boxes will be mounted on them. 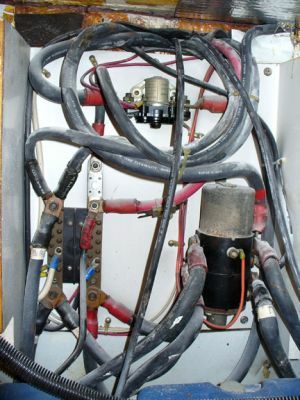 Shown here, 4/0 wire is needed in order to relocate the battery. This has turned into quite a project in itself. 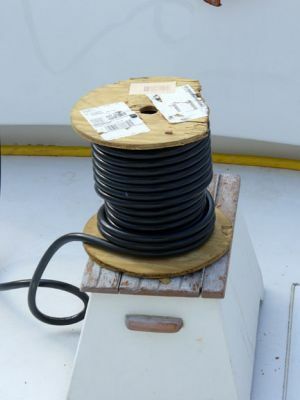 We made sure to purchase proper marine-approved wire for this project. Installing the batteries into the aft compartment proves to be quite a feat. Shown here, Joe Boxer is jugling one side of an 8D battery. Meanwhile . . .
Anchor Bay Is Into Its Work! ... his buddy grabs the other handle and they move the battery into its slot to be strapped down. These guys really get into their work. Yes, there are legs and a body in those shoes. Batteries are strapped down and the positve terminals are covered.